Acres (na hAcraí) is a townland name. Knocknanacree is the 1184th highest place in Ireland. Knocknanacree is the second most southerly summit in the Central Dingle area. Knocknacree is a short walk with a big payload on a good day. Take the smaller road SW out of Anascaul towards Minard, a ruined castle. You will find Knocknacree on your left, between you and the sea. In fact there is no road nearer the coast at this point. We stopped at Q57696 00630 B where there was a widening in the road. Judging by the reactions of a sheep farmer who we met on our way back I don't think there's any great access problem around here. Essentially there is one layer of rough field between the road and the open hillside. The farmer we met owned one of these and was utterly uninterested in what we were doing there. The climb up Knocknacree (known locally as Acres) is surprisingly difficult although short. It's at a steep gradient and has a sort of knee high dwarf furze growing on it. Don't wear shorts. Eventually you reach the ridge and can walk some 750m to the summit with great views on all sides on a good day. It would also be possible to park nearer to the summit if you wanted to, and indeed there seemed a few places where there was both parking and easy access onto the wild hillside. The summit has trig pillar. 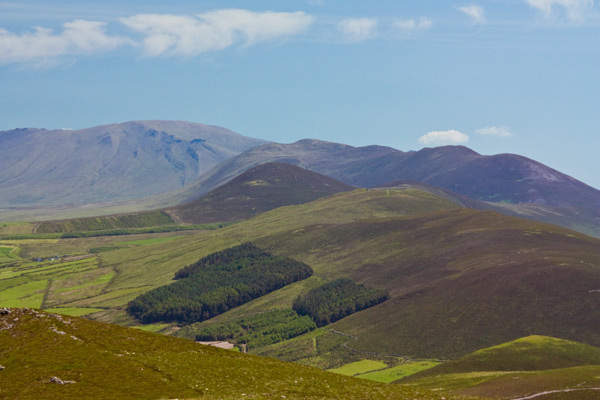 The picture shows the series of ridges gradually descending from the higher Slieve Mishs. Knocknacree is almost at the end of this series of ridges.